Associated Press: Healthy Roast for the Holidays? With Pork, Easily. Craving a beautiful and delicious roast pork or beef but wanting a healthier (and easier) option for the winter? 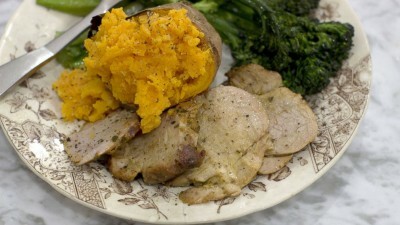 In this week’s “Healthy Plate” column, I focus on a cut of meat that will do just that: the pork tenderloin. This smaller and lower-fat cut cooks quickly, is packed with protein, and makes for an easy weeknight meal. Find out how to keep yours flavorful and moist with two must-have tips, and then try my Mustard-Marinated Pork Tenderloin Roast. Talk about roasted slice-and-serve bliss. Click “View Article” to read the column and get my recipe. Read more from AP food writers and share feedback on social media using #APeats.